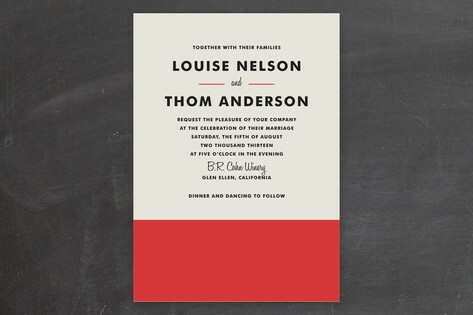 Something about this invite has absolutely captured my imagination–can't you just see a backyard wedding in a beautifully restored Craftsman home, Louise wearing a colorblocked cotton shift and Thom passing out Aperol cocktails in highball glasses? Or maybe that's just me. What kind of wedding do you think suits this suite? Color Block wedding invite by Paper Dahlia at Minted. I actually think this is simply sophisticated. I can totally picture a little white chapel. I would definitely agree...or maybe its in Palm Springs with some fun red & white beach balls by the pool! I picture a sparse white loft with an amazing rooftop terrace for post-ceremony cocktails. I'm thinking Kate Spade- preppy and timeless. Neo traditional. Oh I love this. Would totally do my invitations over again with this style. Ha. I definitely see the backyard vibe. YES! I am right there with you. I love this invite. I'm very taken with this! So different and fresh!! it looks like a book cover. i agree.... so very kate spade. Ooh, I love that. Very chic! High school science lab. I missed a word. I love this invite, it's not cliche and over the top, it's simple and perfect! I would say pretty contemporary although it would be fun to see the pics from the wedding...could be preppy, too! These make me think of penguin books! Which of course makes me completely love them. this is so lovely and chic. i immediately thought of a rooftop city wedding! Those invites are beautiful ... oddly enough, we did our invitations FINALLY (2 months before the wedding, SERIOUSLY) and we had the hardest time ... everyone else's always seemed so effortlessly THEM. Ours were impossible. We have a dozen different designs we didn't use and would never use. Maybe we can donate them to charity, ha. I totally agree. I love how an invite can really set the tone for the event.